We’d love your help. Let us know what’s wrong with this preview of Magic of Wind and Mist by Cassandra Rose Clarke. One day when Hanna is Taking place in the world of Cassandra Rose Clarke’s Magic of Blood and Sea, this is the story of a would-be witch who embarks on an adventure filled with intrigue, mystery, mermaids, and magic. To ask other readers questions about Magic of Wind and Mist, please sign up. Is the release date in october still on? While I really enjoyed this book it was nowhere near as good as Magic of Blood and Sea was. I liked the story itself yet the ending was rushed and quick. It was enjoyable and had potential, but lacked some depth for me. you can find this review on my blog! I was not sure if I would like this book considering what I felt about Clarke's other series set in this world. So imagine my surprise when I found myself liking it better. I will admit that this duology didn't intrigue me as much as Blood and Sea. For one, there weren't any pirates or assassins. I was worried I would be bored, but something I noticed almost immediately was how different the writing was! Part of what bothered me about Ananna's series was tha you can find this review on my blog! Part of what bothered me about Ananna's series was that her voice was so annoying. It got under my skin so often it was a miracle I managed to finish those books as soon as I did. Not only that, but there was this... lack of emotional connection to whatever was happening, it felt like. Anyway. Hanna's voice was so different! It was refreshing and it was easy to like her. Hanna herself was a great character. I hated how often she'd be left in the dark by various people on her adventure—she's part of it, so she should know exactly why and what the hell was happening! It infuriated me and I'm glad that Hanna dealt it the best she could. She went her own way and she was smart about it! At times I thought she'd just endure it, wait until they offered her bits of information, but I'm so glad that didn't happen. Hanna's story wasn't... as adventurous as Ananna's. At least, not the first book, The Wizard's Promise. The beginning was exciting but everything after was very lowkey. It was a different pace and I was surprised, but I think it worked really well for this series. But, at the same time, there was no urgency to Hanna's situation? She's so far from home and everything she's been doing was to get enough money to sail home, but she also had to deal with the Mists coming after her/her old captain. But... I just never really felt that supposed deadline her old captain (Kolur from the synopsis) had. I liked the romance! Must of it happened in the second book, and there wasn't really any buildup in book one, so everything was sort of left to happen in The Nobleman's Revenge. But it was so sweet! I liked the love interest, Isolfr. He was so different than typical love interests! Hanna had constantly called him a coward—and for good reason—and seeing a guy love interest in that aspect rather than the protector/fighter was so refreshing. I can't help keep comparing this to Ananna's story. Where in Blood and Sea we had two very capable people handling things, Wind and Mist was not like that. Isolfr and Hanna have magic but they're not accustomed to fighting for their lives. And having them be the stars of book 2 was a refreshing take. This book seems charming enough, but I don't have the patience for it right now. It's a thick book. At 80 pages in, this is what has happened: Hanna, our main character, has been taken by her fisherman mentor to an island. He did this without consulting her or letting her know what's going on. At this island, they picked up another person. Now they are sailing again. No one will tell Hanna where they are going or why, because .... I don't know. Hanna has also made contact with a beautiful boy who This book seems charming enough, but I don't have the patience for it right now. It's a thick book. At 80 pages in, this is what has happened: Hanna, our main character, has been taken by her fisherman mentor to an island. He did this without consulting her or letting her know what's going on. At this island, they picked up another person. Now they are sailing again. No one will tell Hanna where they are going or why, because .... I don't know. Hanna has also made contact with a beautiful boy who can swim and keep up with the boat in a frigid sea. He wants to be her friend, but also won't tell her anything about himself, where they are going, or why he can't tell her anything. This duology was as good as the Magic of Blood and Sea one with The Assassin's Curse and The Pirate's Wish. It was great rereading an updated and revised version of The Wizard’s Promise and finally being able to read the unreleased The Nobleman’s Revenge in this Magic of Wind and Mist. Everything fell into place while I was reading and I found myself liking the characters and the adventures even more this time around, and I was happily surprised to see a small cameo from Ananna and Naji! I wante This duology was as good as the Magic of Blood and Sea one with The Assassin's Curse and The Pirate's Wish. It was great rereading an updated and revised version of The Wizard’s Promise and finally being able to read the unreleased The Nobleman’s Revenge in this Magic of Wind and Mist. Everything fell into place while I was reading and I found myself liking the characters and the adventures even more this time around, and I was happily surprised to see a small cameo from Ananna and Naji! I wanted more of them in this series, but at least there was a glimpse of them. The story was interesting and different than in Magic of Blood and Sea, but they were once again trying to stop Lord Foxfollow from going into the world and destroying it, this time around with Hanna, a fisherman's apprentice who wants to train as a witch, Isolfr, a spirit of the North Wind and other characters that helped in the adventures and defeat of Lord Foxfollow. I thoroughly enjoyed the new magic and spells introduced and even the romance that showed up between Hanna and Isolfr. I have been waiting for this book for four years since I read The Wizard's Promise. I loved the Assasin's Curse books by Cassandra Rose Clarke and I couldn't wait to see how this new duology in the same universe would end. In Magic of Wind and Mist, Hanna is a fisherman's apprentice with dreams of becoming a skilled witch and having adventures like the ones her mother had as a pirate. She gets what she asked for when a normal fishing trip turns into something much more dangerous, but it's nothin I have been waiting for this book for four years since I read The Wizard's Promise. I loved the Assasin's Curse books by Cassandra Rose Clarke and I couldn't wait to see how this new duology in the same universe would end. 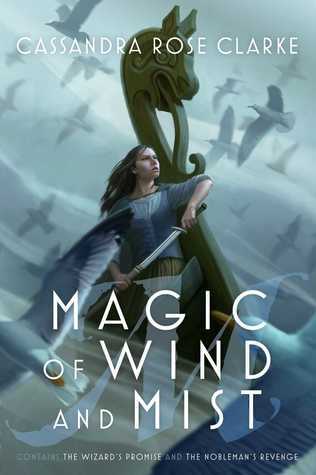 In Magic of Wind and Mist, Hanna is a fisherman's apprentice with dreams of becoming a skilled witch and having adventures like the ones her mother had as a pirate. She gets what she asked for when a normal fishing trip turns into something much more dangerous, but it's nothing like she expected. I enjoyed the individual tones of each character, but Isolfr is the one that intrigued me four years ago and had me keeping a keen eye out for the duology when it finally released. I especially appreciate how much Isolfr struggled to find and keep his courage in dangerous situations. If I could change one thing about the story, I'd have it dig even deeper into the relationship between Hanna and Isolfr. They went through a lot and I would have liked to see even more development for them. Exceptional character development and world building, and I very much enjoyed the main protagonist and agreed with her choices and feelings. The pacing of the story, however, is what ruined it for me. The story was very slow (which can be ok) until the end, at which point it felt like all of the action in the entire story was crammed into 100 pages. Further, the great villain anticipated throughout the book was defeated with relative ease... which is always quite a let down. Overall, worth the r Exceptional character development and world building, and I very much enjoyed the main protagonist and agreed with her choices and feelings. The pacing of the story, however, is what ruined it for me. The story was very slow (which can be ok) until the end, at which point it felt like all of the action in the entire story was crammed into 100 pages. Further, the great villain anticipated throughout the book was defeated with relative ease... which is always quite a let down. A good young adult fantasy book. (A rare find). I didn't even think of it as YA until I was half way through when the main character did something unusually stupid. I enjoyed the world building although there were times when I think the story could have moved more quickly, but perhaps this added to the texture of the story. I give this book a solid 3 stars. I did enjoy the story, but it didn't captivate me like the previous duology by Cassandra. I kept finding myself missing the excitement. There were also a bunch of typos, almost like it wasn't looked over carefully. This was a decent connecting side story/follow-up to Magic of Blood And Sea (The Assassins Curse + The Pirates Wish). Though I cant honestly say that I personally enjoyed it as much as I did Magic of Blood and Sea. I so wanted to love this, Hanna is such a great character and I loved the relationship between her and Isolfr and their friendship, but I felt that they were not deep enough. We found out about the details we had to, but not enough extras that made them come to life. Additionally, the plot was long winded for the first part of the book, so releasing this as a duology was a necessity in that respect. There were parts of the books where I felt it was a long tangent that was important for Hanna's c I so wanted to love this, Hanna is such a great character and I loved the relationship between her and Isolfr and their friendship, but I felt that they were not deep enough. We found out about the details we had to, but not enough extras that made them come to life. Additionally, the plot was long winded for the first part of the book, so releasing this as a duology was a necessity in that respect. There were parts of the books where I felt it was a long tangent that was important for Hanna's character, but were confusing at the time reading it.